There are six churches in Hesters Way: three Church of England, one Catholic, one Baptist and Bethany Hall which is Brethren. The whole of Hesters Way is in the Parish of St. Mark's Church of England. St. Marks Church was built to fulfil a need, for the new Libertus estate, described in 1860 as "comprising numerous pretty respectable cottages", and also for Rowanfield where houses had been built for railway workers after the railway came to Cheltenham in 1840. The architect, John Middleton, chose the Gothic style for the Church. St. Mark's was consecrated on 8th February, 1862 and seated 517 people and cost �4,700. In 1887 the Church was so full, two transepts were added at a cost of �1,800. The Church then seated 840 people! The area had been known as Lower Alstone and came in the Parish of Christchurch, until it became the Parish of St. Marks after the Church was built. The first daughter church built by St. Marks Parish was in 1885 on Hesters Way, known as the Mission Church or "the tin church", as it was built of corrugated iron. It is difficult to see a need for this as there were few buildings in the area, just farms, nurseries, and a mill in Arle. When this church was taken down in 1952, a temporary building was built on the same site and this was called St. Silas. In 1959 a further temporary building was erected to be used as the church, the old building being used as a hall. The Parish later sold the land and purchased the M.E.B. building on Hesters Way Road and converted part of it into a church and used its many other rooms for numerous activities. In 1946, once building had started on the Hesters Way estate, a temporary church building was erected on Orchard Way and called St. Barnabas. In 1973 a permanent building was erected on the same site, plus a hall. A new hall was also added in 1991. In April 1954 an army hut was erected on what was to become Coronation Square. It took five weeks to erect, members of the congregation having first dug out the footings. This hut cost �1,000, including the chairs and fittings, and was called St. Aidans. Although it looked like an army hut outside, according to the Gloucestershire Echo ' it was very welcoming and cosy inside'. The new church was dedicated on 28th May, 1954. The foundation stone for the permanent building was laid on 9th April, 1959 and the building was finally dedicated on 12th March, 1960. The congregation were forced to accept a building with a tower, as the Planning Department wanted it to dominate the square, but less than a year later they built India and Pakistan Houses dwarfing the Church. The Parish were in debt for years paying for a building, which wasn't what they wanted. The Baptists on Hesters Way having no church of their own were meeting in private homes for services and prayer meetings and decided they too must have their own church. A site was offered at a 'favourable' price by the local authorities on Ashlands Road. The building was opened on 1st June, 1957. When Father Nolan came to Hesters Way Parish from St. Marys, Bath and was asked what sort of parish he was inheriting, he replied "It's a green field with white ponies grazing on it". This piece of land was on Princess Elizabeth Way, opposite the end of Orchard Way. Catholics in the Parish were meeting in St. Marks Community Centre at that time, but Father Nolan's inspiration was to change all that. It was decided that they would build a hall first which was completed by 1962. The Presbytery, Father Nolan's house, was completed 1964. A fund had been started in 1960 with contributions of 2/6d (12.5 pence) per wage earner, but by 1967 there was still a debt of �7,000. Building Plans still went ahead for the church although the bank had refused a loan, but Father Nolan's faith 'moved mountains' because St. Thomas More's Church was opened and blessed in December 1966. Sadly, just two years later, Father Nolan died. The other church on Hesters Way is Bethany Hall (Brethren) in Newton Road dating from about 1955. WHAT WENT ON IN THESE CHURCHES? These churches have seen much community activity. During the 1950's to 1970's there were large Sunday Schools, church and choir outings, Harvest Suppers that are still remembered today, when food was prepared, games and entertainment provided by members of each congregation, sketches, musical entertainment, with one curate at St. Aidans, Bob Paget, having to endure a 'This is Your Life' which he took in good part. The Church of England churches all ran Campaigners - similar to the Scouts and Guides, but starting at 61/2 years instead of 8 years. National summer camps were held, which were enjoyed by boys and girls. Inter-group competitions were held, in drill and sports, which encouraged young people greatly. There were badges to be worked for, Bible passages to be learned and Christian standards set for all who came. Many churches arranged Bank Holiday walks and picnics, in the Cotswolds and the Forest of Dean. 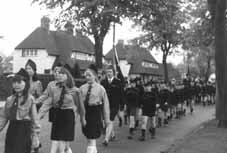 The Baptist Church, as well as Sunday Schools, had a boys' Brigade marching round the local streets on special occasions, when people came out of their homes to watch and hear the band. St. Marks Parish had large Youth Groups for 141/2 to 181/2 year-olds. Every year one hundred or more went on the parish holiday at 'The Gaines' in Worcestershire. The Gaines had its own swimming pool and the Rev. Mike Thomas got thrown in the pool by the young people. Everyone had a great time, with the parents attending for one evening for the bonfire night and hot dogs. The youngsters came back exhausted but happy. St. Thomas More held Christmas Bazaars and Summer Fetes, and also ran an over-60's club and Bingo sessions. In April 1970, 166 children took their first Communion, so their Sunday Schools must have been large. Guides and Scouts also met at St. Thomas More's. Sadly only a Brownie Troop meets there now and the average Confirmation is only 14-16 per year, but Father Patrick (the present priest) has a vision of drawing more young people back into the life of the church through his visits and ministry at St. Benedict's Senior School. Westfields Youth Club in Goldsmith Road opened as a result of the Albemarle Report on youth in the early 60s. When St. Marks Youth Club closed, the young people joined the 100 to 150 at Westfields. In 1955 Len Deacon started a football club for St. Aidans choirboys, and called them Hesters Way Colts. The club is still running although there are no choirboys now. Len Deacon is still involved.